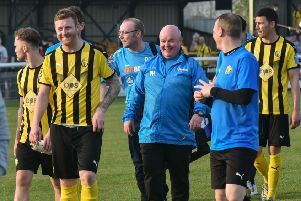 Leamington boss Paul Holleran said his side ‘set the benchmark’ for the remainder of the season with their performance against Solihull Moors. An 88th-minute winner from Danny Newton split the two sides and lifted Brakes out of the Conference North’s bottom three in the process. The defensive display was in stark contrast to that produced at Edgeley Park seven days earlier and Holleran said the clean sheet was the most pleasing aspect of the victory. “As disappointed as I was at Stockport, the tables were turned,” said Holleran. “Every single player was where he needed to be. “We knew Solihull would be a threat from set plays with two of the tallest players in the league. “But they only had two chances in 90 minutes: a Boyle shot from 25 yards which Ross (Atkins) dealt with and a cross-shot. “That’s with a strikeforce of Omar Bogle, Stefan Moore and (Ryan)Beswick to add a bit of width. “As a group we defended in lines, were so much more compact and the lines between the back four and the midfield three were where they needed to be. “But we still had to go and play and we looked a threat going forward. Leamington were denied the chance to build on the three points when Tuesday night’s home fixture against Chorley fell foul of a frozen pitch. A trip to Harrogate Town tomorrow now awaits and Holleran admits he did not expect Simon Weaver’s side to be languishing with them in the lower reaches of the division. “We’re in the pack of teams realistically we probably thought we would be. “But Harrogate are the one side in the bottom half that no one predicted. “In the summer they brought in James Walshaw, Lloyd Kerry and Dave McGurk and they’ve got a lot of player power. “I like Simon, he’s a good kid, but he’ll be a bit disappointed in where they are.